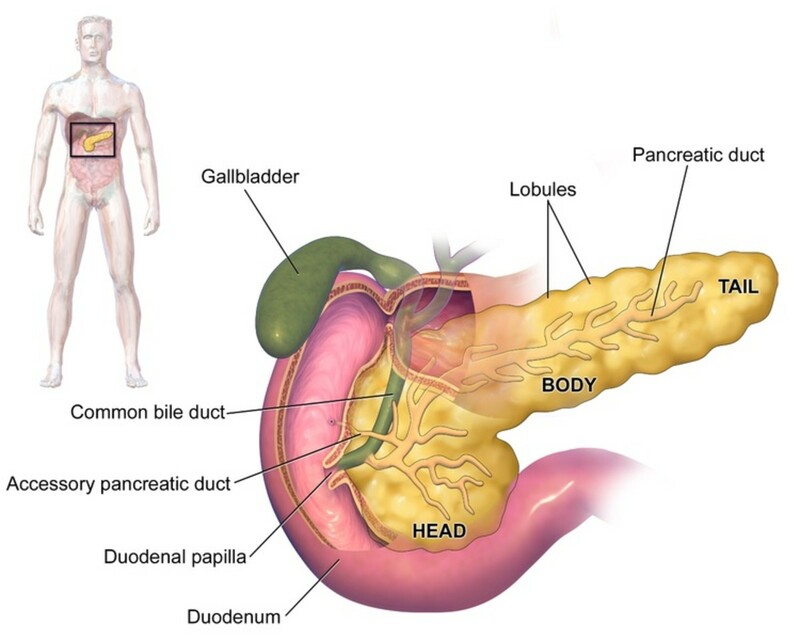 The pancreas is an elongated organ located in the upper abdominal cavity, next to the duodenum and behind the stomach. The organ acts as a gland and releases vital secretions. The pancreas is really two glands in one because it has two different functions that are performed in different tissues. One function is to produce digestive enzymes that break down food into a form that our bodies can use. The other is to produce hormones. Three major disorders related to the pancreas are pancreatitis (inflammation of the pancreas) and type 1 and type 2 diabetes. A variety of factors can cause pancreatitis. Type 1 diabetes is an autoimmune disorder. An unhealthy lifestyle is often a contributor to the development of type 2 diabetes, although not everyone with the disorder has a lifestyle problem. The pancreas contains cells that produce and secrete digestive enzymes. The enzymes travel to the duodenum through a tube called the pancreatic duct. The duodenum is the first part of the small intestine. Once in the intestine, the digestive enzymes break down food into tiny particles. These particles are then absorbed through the lining of the small intestine into the bloodstream and distributed around the body to the cells that need them. The pancreas produces many types of digestive enzymes, including proteases, which digest protein, pancreatic lipase, which digests fats, and pancreatic amylase, which digests starch. The enzymes are released from the pancreas as part of a liquid known as pancreatic juice, which contains sodium bicarbonate and water in addition to digestive enzymes. The sodium bicarbonate neutralizes the acidic material entering the duodenum from the stomach. The proteases in pancreatic juice are released in an inactive form, which prevents digestion of the proteins that form part of the pancreas. Normally, the inactive proteases (trypsinogen and chymotrypsinogen) don't become active until they enter the duodenum. Here they are converted into trypsin and chymotrypsin, which digest the proteins in food. 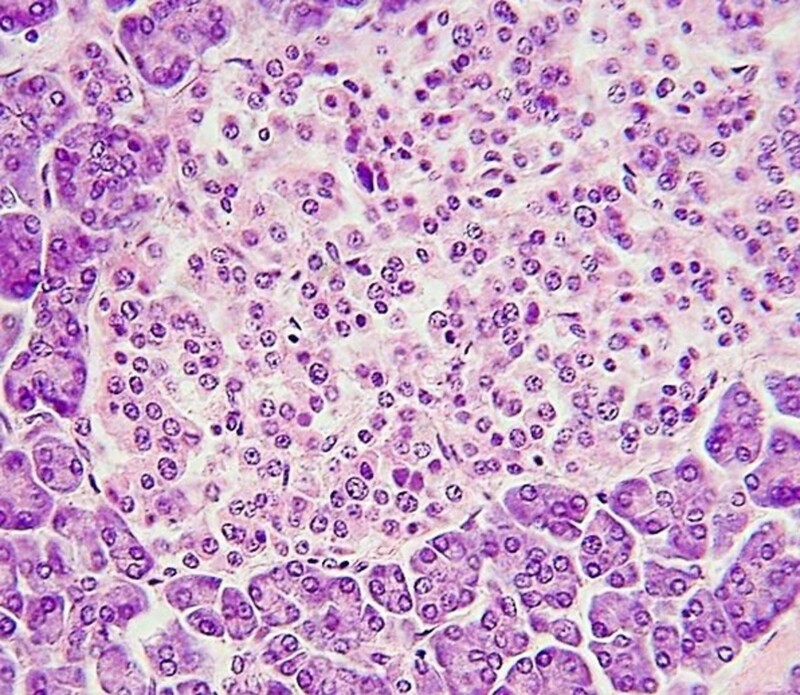 Pancreatic enzymes are produced and secreted by cells called acinar cells. These cells are grouped into clusters called acini. (The singular term is acinus.) Acinar cells are classified as exocrine cells because they send their secretion into a duct, or passageway. 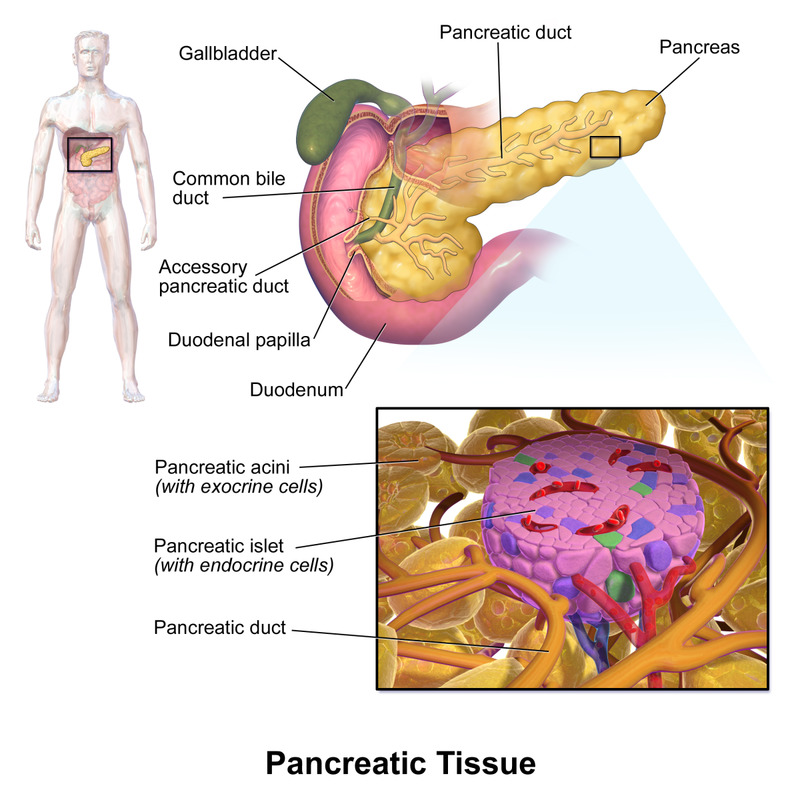 The pancreas contains patches of tissue called islets of Langerhans or pancreatic islets. Each islet contains endocrine tissue, which is tissue that produces hormones and secretes them into the blood. Two important pancreatic hormones are insulin and glucagon. Insulin is made by the beta cells in the islets. 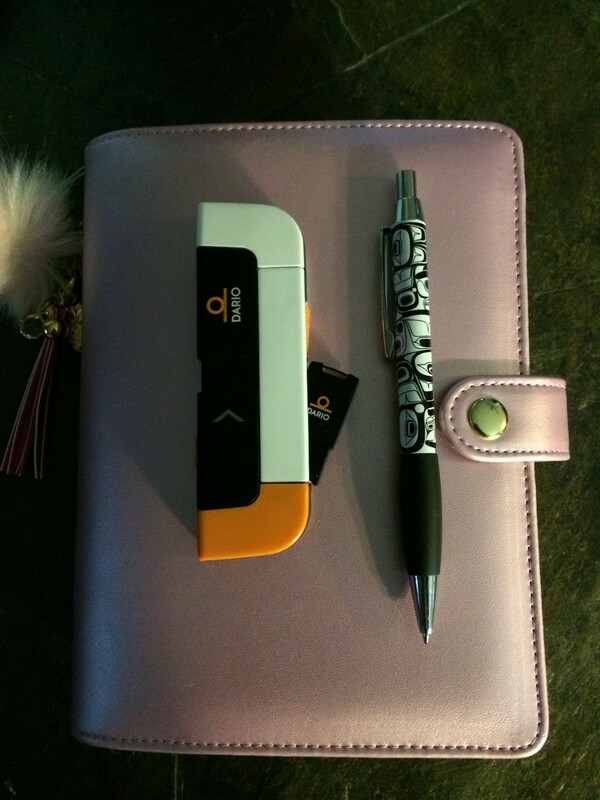 Glucagon is made by the alpha cells. Insulin is a small protein that has a very important function. It helps to regulate the blood sugar level by joining to a receptor on the membrane that covers the body's cells. Once the insulin molecule has joined to the receptor, the membrane permeability changes, allowing glucose to enter the cell. As a result, the blood glucose level drops. Cells produce energy from the glucose molecules. In the liver, the absorbed glucose is converted to glycogen, a storage form of energy. Glucagon stimulates the breakdown of liver glycogen into glucose molecules, which then enter the blood to travel to cells. 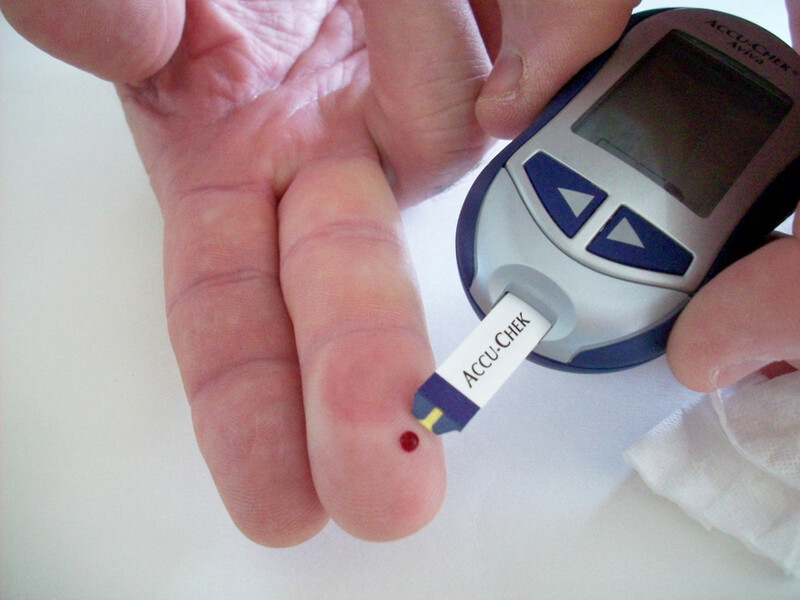 Glucagon therefore raises the blood glucose level and has the opposite effect to insulin. In a healthy person, insulin and glucagon work together to maintain a fairly constant glucose level in the blood. Gucose is absorbed from the blood when it's abundant and released into the blood when its level falls too low. The two common forms of pancreatitis are an acute and a chronic type. Acute pancreatitis is a sudden inflammation of the pancreas that lasts for a short time. It needs medical treatment instead of disappearing on its own, however. There are several possible causes of acute pancreatitis, but the two most common are blockage of passageways with gallstones or the ingestion of an excessive amount of alcohol. Acute pancreatitis may develop when a gallstone is released from the gall bladder into the common bile duct. This duct transports bile from the gall bladder and the liver to the duodenum. 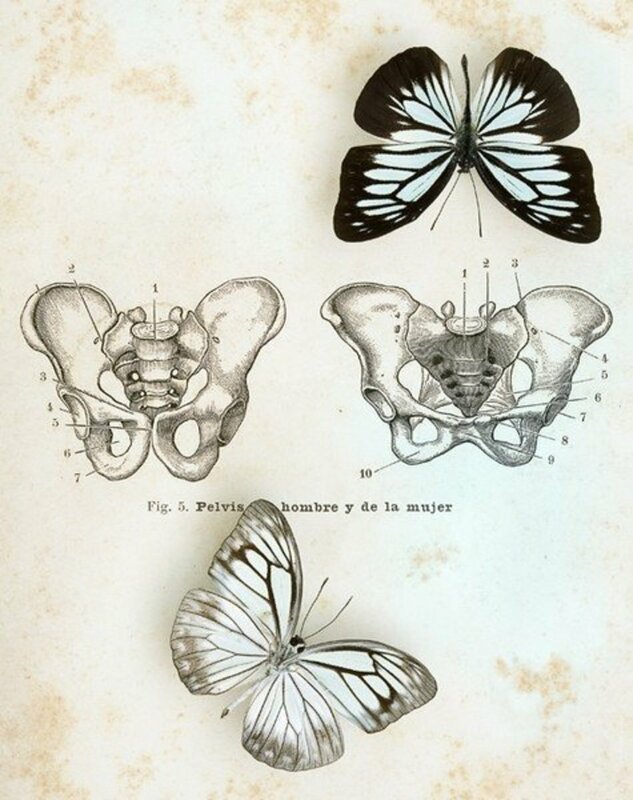 (It can be seen in illustrations shown above.) At the surface of the duodenum, the common bile duct joins the pancreatic duct to form a structure called the ampulla of Vater. A gallstone in the ampulla of Vater can block the opening of the pancreatic duct, causing pancreatic juice to back up and collect in the pancreas. The excess juice and its contents cause swelling and inflammation in the pancreas. The digestive enzymes in the juice may become active and damage tissues. Acute pancreatitis can also develop several hours after drinking alcohol, although the exact mechanism by which alcohol inflames the pancreas is not known. Less common causes of acute pancreatitis include certain medications or infections, injury to the pancreas, a high blood fat level (hyperlipidemia), or a high blood calcium level (hypercalcemia). People with cystic fibrosis may experience periods of acute pancreatitis. Sometimes the cause of the condition is never discovered. A common symptom of acute pancreatitis is pain in the middle of the abdomen, which ranges from mild to extremely severe. The pain may radiate to the back. There may also be nausea, vomiting, a fever, and a rapid pulse. In severe cases, there may be dehydration and low blood pressure. The treatment for acute pancreatitis depends on how severe the attack is. Medical attention must be sought. Strong pain killers are usually given to the patient. Gallstones may need to be removed and antibiotics will probably be given if an infection is present. Other supportive steps, such as intravenous fluids, may be necessary in severe cases. Surgery may be required to remove damaged pancreatic tissue. If a specific medication is suspected of causing the pancreatitis, the medication will probably need to be changed. Medication may be needed to reduce the blood fat or blood calcium level. Patients are usually advised to drink no alcohol after an attack of acute pancreatitis—even if alcohol wasn’t the cause of the attack—and to eat a low fat diet. In chronic pancreatitis, the pancreas is continually inflamed. The pancreas is gradually destroyed and filled with scar tissue. The most common cause of chronic pancreatitis is long-term alcohol abuse. However, other factors, such as chronic or recurring hyperlipidemia and hypercalcemia, certain autoimmune conditions, and some inherited conditions, such as cystic fibrosis, can also cause chronic pancreatitis. The symptoms of chronic pancreatitis are similar to those of acute pancreatitis, but in addition the patient often suffers from weight loss. This is due to the fact that the pancreas is no longer making enough digestive enzymes. Without enzymes, food can’t be digested. If food isn’t digested, it can’t be absorbed. The patient may also have diarrhea and oily feces. He or she will develop diabetes if the beta cells in the pancreas are destroyed. Calcium stones may form and may block the pancreatic duct. The risk of developing pancreatic cancer increases in people with chronic pancreatitis. Anyone with symptoms that might indicate the presence of pancreatitis or diabetes should visit a doctor for a diagnosis and treatment. There are two main types of diabetes mellitus—type 1 diabetes and type 2 diabetes. Type 1 diabetes used to be called insulin-dependent diabetes or juvenile diabetes because it always requires insulin treatment and generally first appears in children, teenagers, or young adults. It may sometimes appear in older people, however. In North America, about ten percent of people with diabetes have type 1 diabetes. Type 2 diabetes used to be called non-insulin dependent diabetes or adult-onset diabetes. “Adult-onset” is no longer considered to be an appropriate term, since young people can develop type 2 diabetes, especially if they are overweight. Approximately ninety percent of people in North America with diabetes have type 2 diabetes. In type 1 diabetes, the pancreas no longer makes insulin. The disorder is an autoimmune condition, or one in which the immune system mistakenly attacks the body's own tissues instead of bacteria and other microbes. The immune system attacks and destroys the beta cells in the islets of Langerhans. The patient forms antibodies to his or her own cells. Why the body attacks the pancreas is unknown. The phenomenon is thought to be partly genetically controlled, but scientists think there needs to be another trigger in genetically susceptible people in order to stimulate the immune system to attack the pancreas. The trigger may be infection by certain viruses or exposure to certain toxins. Some viruses suspected of being triggers are the Epstein-Barr virus, the cytomegalovirus, the mumps virus, and the coxsackievirus. Symptoms of type 1 diabetes include frequent urination, increased thirst, hunger, fatigue, and weight loss. There may also be blurred vision and tingling in the feet. Wounds may be slow to heal. People with type I diabetes need to replace the insulin normally made in the body with insulin injections and need to carefully manage their nutrition and exercise. Insulin cannot be taken in tablet form because the stomach would digest the insulin. Polydipsia is excessive thirst and polyphagia is excessive hunger. Polyuria means the production of an abnormally large amount of urine. Glycosuria is a condition in which there is sugar (glucose) in the urine. Insulin resistance is the name for the condition in which the body becomes less responsive to the usual amount of insulin. For a while, the pancreas makes more insulin to overcome the insulin resistance. Eventually, the pancreas cannot make enough insulin for the body’s needs. At this point insulin resistance has become type 2 diabetes. In this type of diabetes, the pancreas makes an insufficient amount of insulin and the person’s body is unable to use the insulin that is made properly. Heredity plays a role in type 2 diabetes. Having a close relative with this form of diabetes increases the risk that a person will develop the disorder. However, lifestyle also strongly affects the probability of developing the disease. Risk factors include being older than forty, being overweight, having high blood pressure, and having high blood cholesterol or triglycerides. It’s very important for older people to maintain a healthy diet and lifestyle, because this will greatly decrease the chance of developing type 2 diabetes. An alarming trend in many countries is an increasing incidence of Type 2 diabetes and obesity, even in young children. 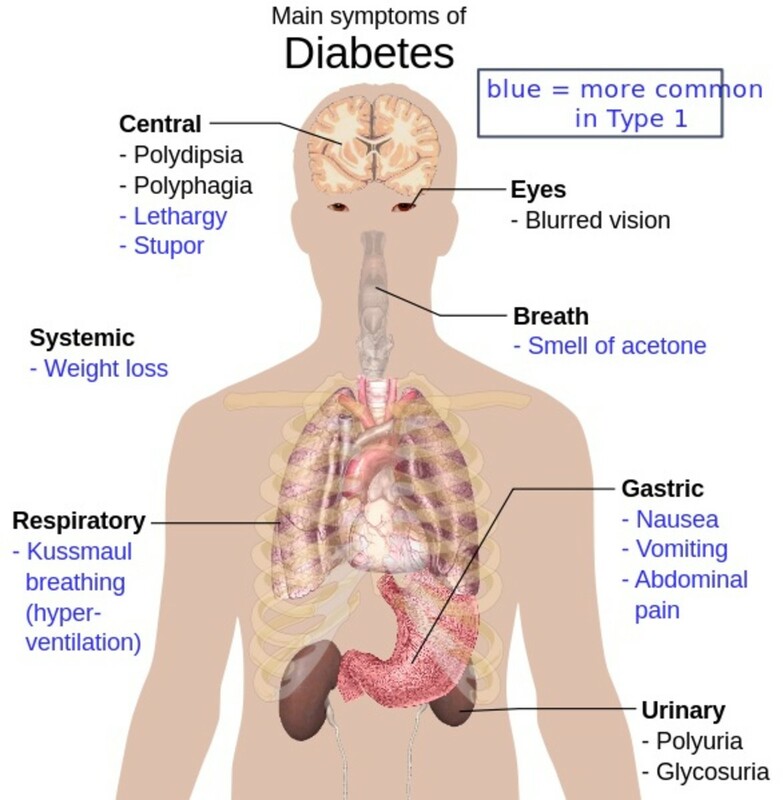 Symptoms of type 2 diabetes are generally similar to those for type 1 diabetes. In the early stages of the disease, diet and exercise may be able to control the symptoms. Unfortunately, type 2 diabetes is often a progressive disorder. Medications may eventually be necessary. Although type 2 diabetes often occurs in people who have made unhealthy food choices, get an inadequate amount of exercise, and are overweight, the condition sometimes appears in slender people. The cause of the disease is not fully understood. Type 1 and type 2 diabetes can’t be cured, but they can often be successfully managed. The goal is to prevent complications of diabetes from developing, or at least to delay them. These complications include nerve, kidney, and eye damage, circulatory problems, heart disease, and the development of feet, skin and mouth problems. Diabetes may also increase the risk of osteoporosis and hearing problems. Some types of diabetes don't fall neatly into the type 1 or type 2 category. Gestational diabetes is a temporary condition that develops in some women during pregnancy. The cause of the condition is uncertain. It's thought to arise because chemicals released by the placenta interfere with the action of insulin in the mother's body, increasing her blood sugar level. Gestational diabetes can be treated. This treatment is important in order to protect the developing baby. Diabetes can also develop when parts of the pancreas are destroyed or removed, which may happen in pancreatitis or pancreatic surgery. Some drugs and hormonal problems can also produce diabetes. 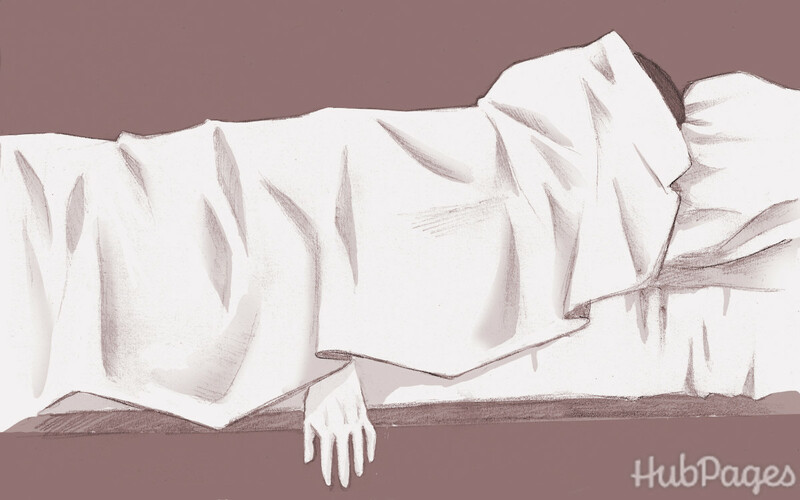 It's possible to live without a pancreas. It's not possible to live without pancreatic functions, however. Supplemental enzymes and hormones must be taken by someone without a functioning pancreas. Special attention must be paid to the administration of these chemicals with respect to time and quantity. The patient must also pay attention to their overall health. 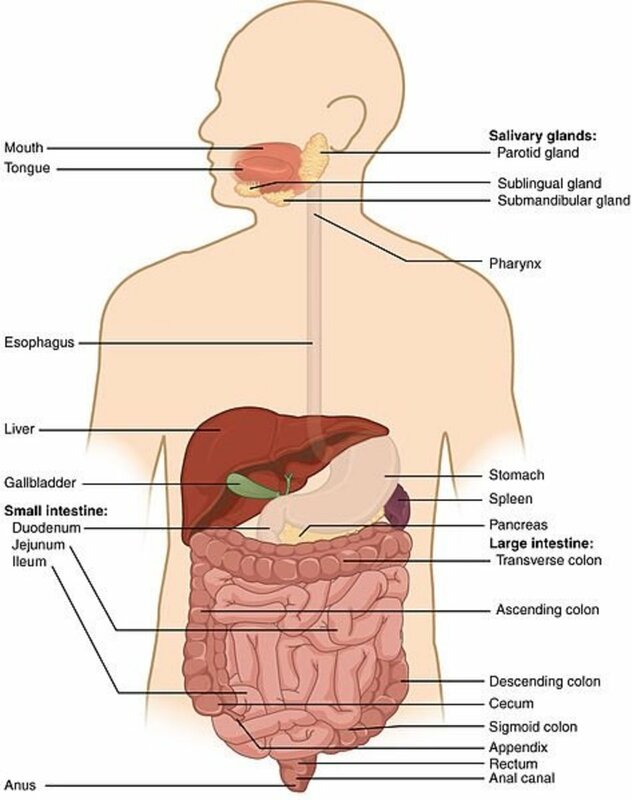 The pancreas is an important organ. It's wonderful that science has found a way for patients to survive without a pancreas. The patient has some vital things to consider and remember as they perform substitutions for the natural processes in their pancreas, however. The substitution process may be demanding. Is <500 pancreatic elastase-1 normal? Pancreatic elastase-1 is a digestive enzyme made by the pancreas and released into the small intestine, where it digests certain proteins. The enzyme travels through the small and large intestine and leaves the body in the feces. The level of the enzyme in the feces is tested to assess the health of the pancreas. Your doctor is the best person to interpret the results of your lab test. (I'm assuming that the doctor has a copy of the lab results. It's important that they do because they have to assess the results.) The doctor will likely want to see the precise numbers on the lab result sheet as well as any other important information. My doctor contacts patients if lab test results are abnormal, and doesn't if they are normal. I don’t know how your doctor handles the results. If you don’t know the physician’s routine and they don’t contact you, you should get in touch with them to ask about the results. Hi, James. As I say in the article, people must visit a doctor if they want to know whether they have a pancreas problem. How will I know if I have this problem. Thank you for the comment, las81071. I'm sorry that you are in such pain. I hope you find an explanation for your stomach problem very soon. Good luck! thanks for the info. I have been researching why I always have terrible pains in my stomach very often. My doctors took out my gallbladder said the pain was from that. Although I have some different pain now it seems to be in the same area really high in the stomach right under the chest. I read a bit about the pancreas but luckily that does not seem to be the same. I appreciate the info. Thank you very much for the comment, Curiad! This is very informative, Thank you for sharing this! Hi, BlissfulWriter. It certainly is a good idea to restrict sugar in the diet! Thank you for the comment. Since the beta cells are so important for producing insulin, I think it is a good idea to try not to burn them out by over-indulgence of sugar. Whenever we eat sugar, it causes rise in our blood glucose level which make the pancreas work harder to produce insulin. Hi, Steve T. I'm not a doctor, but I have read that when a pancreas is chronically inflamed it may stop making insulin. Thanks for the comment, Whimsical Chair. It's nice to meet you! Nice informative hub. Thank you for sharing your knowledge. Thanks, Katie! I appreciate your comment. Thank you so much! Yes, it is a shock to discover that so many people who have diabetes are suffering from Type 2 diabetes. Now why was I under the impression the pancreas is situated in the liver? Thanks so much for enlighten me. What a shock: “Approximately ninety percent of people in North America are suffering diabetes type 2.” This hub about the functions of the pancreas and relative health problems has been bookmarked by me and rated UP in all ways. Thank you for your comment, Debby!